The Ottoman Imperial Archives continues to release amazing pictures, photos and documents from the rich Ottoman history. The painting below is the latest example. We thank the archivists for their wonderful work which can be seen on Twitter @OttomanArchive as well as the archives' website. dignitaries meeting with the Jewish elders. The modern-day caption says "More than 150,000 Spanish Jews Fled the Spanish Inquisition and Brought to the Ottoman Empire in 1492." 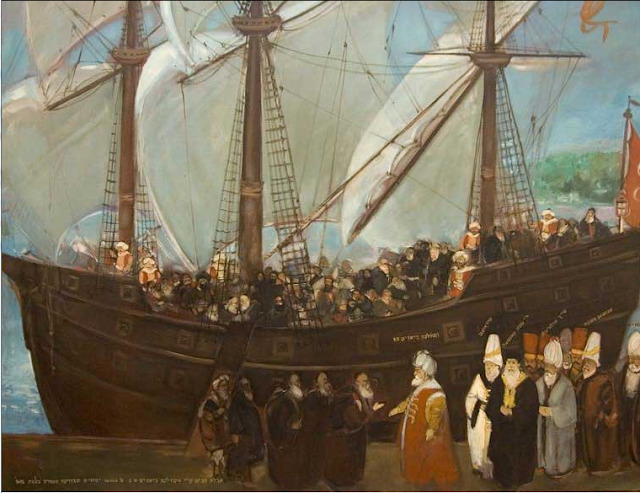 The painting shows Jews who escaped the Spanish expulsion and rabbis getting off their ship and meeting dignitaries. The online reproduction is of low resolution and we cannot read writing on the bottom left of the painting. We have unsuccessfully searched for other copies or details that would indicate when the painting was drawn and the artist. We appeal to readers for suggestions and assistance. The painting is the "The Welcome" (1998) by Turkish Mavlut Akyildiz. I shared this question on The Separdic Diaspora FBpage and received the following answer. "Ressam Mevlüt Akyıldız'ın 1998 tarihli "Welcome" isimli tablosu, 1492 gelişini tasvir ediyor. i.e. artist Mevlut Akyildiz's painting "welcome" depicting the arrival in 1492." I would like to point out that it is a bit unlikely that Sephardim would have worn kippah's in 1492.